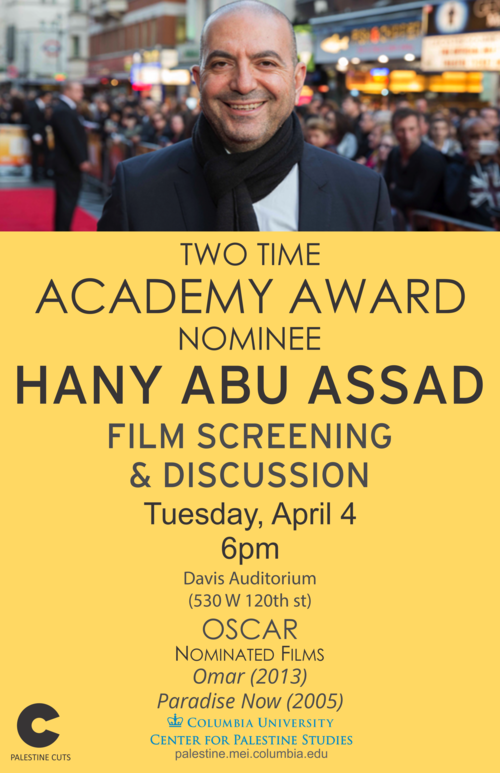 Filmmaker Hany Abu Assad gave a Master Class Evening and screened his film, The Idol, the next night following a conversation with Hamid Dabashi. Hany Abu-Assad was born in Nazareth, Palestine in 1961. After having studied and worked as an airplane engineer in The Netherlands for several years, Abu-Assad entered the world of cinema as a producer and produced the feature film Curfew, directed by Rashid Masharawi, in 1994. In 1998 he directed his first film, The Fourteenth Chick, from a script by writer Arnon Grunberg, followed by his documentary Nazareth 2000, his second feature film Rana's Wedding and his second documentary Ford Transit. In 2006 his film Paradise Now about two Palestinian men preparing for a suicide attack in Tel Aviv, was nominated for the Academy Award for Best Foreign Language Film. The film won the Golden Globe for Best Foreign language film in 2006. In 2011 Abu-Assad finished working on The Courier, a Hollywood movie starring Jeffery Dean Morgan, Til Schweiger and Mickey Rourke. 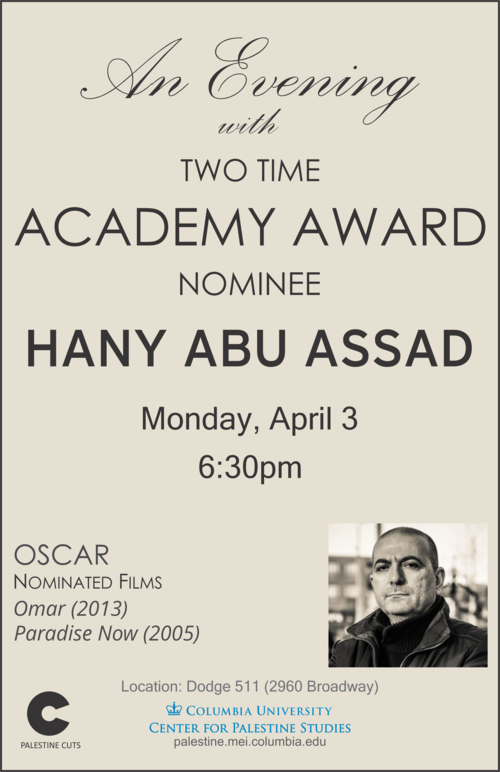 Recently he finished working on OMAR, a tragic love story set in occupied Palestine. OMAR won the jury price in the competition of Certain Regard at Cannes Film Festival of 2013 and and has been nominated for the Academy of Motion Picture Arts and Sciences (OSCARS) for Best Foreign Language Film 2014. In 2015 Abu-Assad completed his 6th feature film "The Idol" Drama inspired by the incredible journey of the artist Mohammad Assaf, a singer from Gaza who won the Arab Idol show in 2013. Currently, he is shooting The Mountain Between Us, a love survival story for Fox 2000 with Kate Winslet and Idris Elba in the leads.